V-Vax Eucalyptus Oil is extracted using a chemical-free, double distillation process to ensure the highest level of purity. The result is a colorless, mobile liquid with heavenly wood-scented undertones. Our organic oil comes from the central New South Wales region of Australia, a semi-arid area which is home to the richest cineole-bearing Polybractea (blue mallee) variety of eucalyptus. 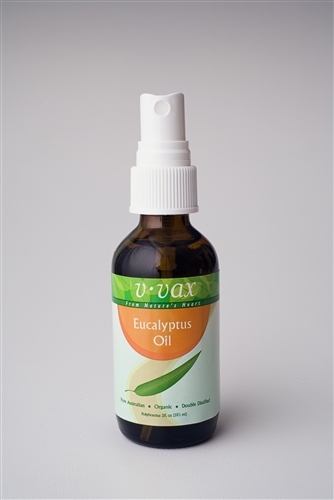 V-VAX Eucalyptus Oil contains 85% to 90% cineole. It blends well with thyme, rosemary, lavender, marjoram, pine, cedar wood and lemon. This product works great for aches and pains for people as well as dogs, and is often combined with lavender. Eucalyptus oil is also gaining popularity for flea and tick control. Can be used to freshen up dog odors in bedding, or even put in your carpet cleaner! Wholesale pricing available for Veterinary clinics! Good for sore muscles in humans and many animals!